I was on a 1-week training course in the Holborn area of London the week before. Whenever I think of Holborn, the image conjured was a vast expanse of tall office buildings virtually desert-like in terms of foodie shops. How wrong I was! The training house I went to was in the Rosebery Avenue-Clerkenwell Road area. While doing a walk-about after our usual sandwich lunch, I discovered a small market in Leather Lane which is parallel to the jewellery centre of London - Hatton Gardens. See the pictures below, to see more closely click on the pictures for an enlarged version. 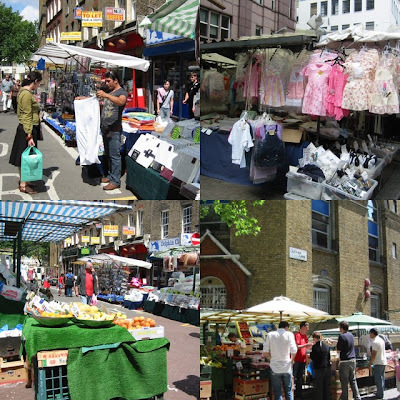 Leather Lane has the usual low-priced stalls for you name it - books, clothes, bags, shoes, jewelries, flowers, etc. But what made my eyes widen with delight are cafes, delis, food stalls, and restaurants that offer interesting food that are not of your usual fastfood chains. This one serves not only burgers and chips but also kebabs, doners, and other Middle Eastern delights. As the name suggests, they do nice bagels plus curries, couscous ... more Middle Eastern fares. Oasis is of healthy-organic food genre. You should see their offerings - they looked so delicious. Here is one of a few juice bars in the market. They looked pretty busy on the day. Now we come to the curry kiosks. The one on the left is the Indian variety and on the left is the Thai variety. Goodness, just smelling the waft of spices from these stalls made my mouth water even though I've just eaten my lunch at the time! This is probably the kiosk with the longest queue, one that offers authentic-looking Mexican food. There are also authentic Italian delis in the area like Terroni & Sons in Clerkenwell Road. This one is on Theobald Road which is about 2 minutes walk from Leather Lane. Above is just one of the authentic-looking Italian restaurants in the area which together with the delis and an Italian Catholic church nearby suggests a high concentration of Italian immigrants in the place.